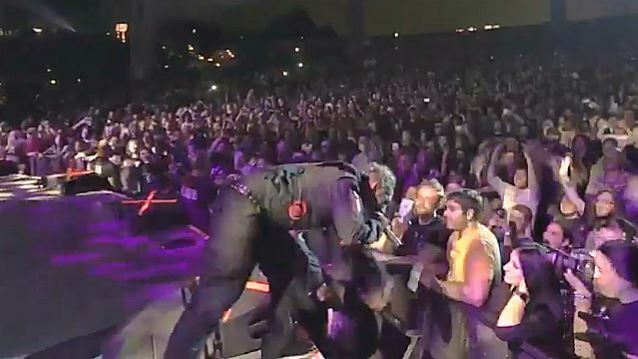 A short video clip of Corey Taylor smacking the phone out of the hand of a texting fan during a recent SLIPKNOT show can be seen below. The SLIPKNOT singer later explained his action by tweeting: "If you're gonna text, stay home." When a female fan told Taylor that she always sends a few texts when she at a show to check in to see how her daughter is doing, Taylor replied: "Fair enough. But you might wanna do it between sets or between songs. Am I right?" Corey also claimed in a separate tweet that the texting fan "TOTALLY understood the fuckup and we laughed together." In a 2014 interview, Taylor — who has had an active social-media presence through his personal Twitter and Facebook accounts — said that he believes that people who hold up their phones and film entire concerts while he is up on stage are "not enjoying" the show. Speaking to the WRIF radio station, Taylor said: "So many people have their faces glued to their phones and they're not paying attention, I point and laugh anytime I see somebody trip walking down the street, and I'm brutal — I mean, I'm brutal. It's loud, it's obnoxious, there's a lot of pointing, I'm asking people, 'Did you see that?' I love it. I think it's funny." Corey added: "Get off your phones and pay attention to what they hell you're doing." Asked if he sees a lot of people looking at their phones at SLIPKNOT concerts, Taylor responded: "I see it every once in a while. People don't do it so much at our shows, and if they do, they do it from quite a ways back, because I empty whole water bottles into people as soon as I see them staring at their phone or tweeting or whatever." "So, yeah, I don't see it as much anymore, because I think I've made the statement that I will ruin your phone if you do that in front of my show." Taylor also lamented the fact that concerts have turned into photography/video sessions, with videos being published on YouTube and photos on various social media sites within hours of the shows' completion. "You're gonna come down there and film it, but you're not gonna enjoy it?" he said. "I mean, get outta here! Are you serious?" He added: "People need to unplug and realize that they're missing their lives, dude. It's sad. And that may be me just being an old jerk, but I don't care. I don't care. Truth is truth; it doesn't matter what age you're at."